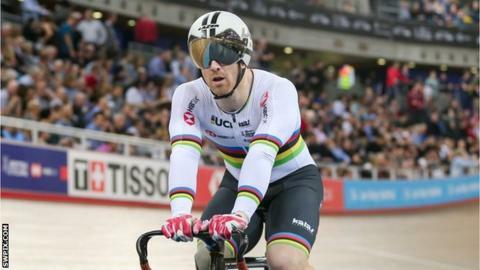 Britain's Jody Cundy, Kadeena Cox and Katie Toft claimed gold on the opening day of the UCI Para-cycling Track World Championships in the Netherlands. Cundy, 40, won his 11th 1km time trial world title, keeping an unbeaten record stretching back to his 2006 debut. Cox, 28, marked her return to major international competition with victory in the C4 500m TT event. Toft became Britain's third world champion of the day with her second successive WC1 3km pursuit title. The 26-year-old was the only rider in her event. There were also silver medals for Sarah Storey (women's C5 500m TT) and Blaine Hunt (men's C5 1km TT). It is the 16th rainbow jersey of Cundy's career and came after he criticised the sport's governing body for the failure to provide live streaming of the event. However, he concentrated on action on the track in Apeldoorn, finishing in one minute 5.42 seconds, over a second clear of Slovakian rival Josef Metelka. "That's my 11th title in a row now, so it's a good place to be in looking ahead to Tokyo next year," he said. Cox, back in top-flight Para-cycling for the first time since the Rio Games in 2016, overcame a knee problem as well as a problem with a gate at the start of the race to to clock a time of 36.176 seconds - more than two seconds ahead of China's Jianping Ruan in second place. "I'm happy to get the win but there was a bit of a technical issue with the gate, so the time wasn't what I wanted," Cox said. "It's frustrating that I've gone so quick with a bad start, but I guess that suggests there's more to come." She led with a time of 38.111secs before the final rider, Caroline Groot of the Netherlands surpassed that with 36.464secs to take gold. Hunt went one better than last year's Worlds with silver behind Spanish defending champion Alfonso Cabello Llamas. Team-mate Jon Gildea was fourth, missing out on bronze by 0.129secs. World Championship debutant Fin Graham also narrowly missed out on a medal, losing out in the bronze ride-off in the men's C3 3km individual pursuit.